Lifelong learning is not an empty concept. It is a key to career success. Education is important for initial entry into the labor force. Lifelong learning is equally important to succeeding over one's working career. Education comes in many shapes and sizes, and you and your child need to plan for it. Most people in the U.S. labor force have completed high school. Looking at the younger workers today (between the ages of 24 and 34), only 7 percent have not finished high school. Today's high school graduates are more likely to go to college than in the past. In 1970, only 52 percent of the high school graduates had enrolled in college by the following fall. In 2000, 63 percent of the graduates had enrolled. Most young people recognize the value of education after high school, at least to some degree. In 10th grade, 90 percent report that they expect to continue their education after high school, according to the National Center for Education Statistics - and over 50 percent anticipate getting a bachelor's degree or higher. In 2005, Public Agenda published a study of aspirations of young Americans, age 18 to 25. Consistent with other national data, they found for every two students who pursue some form of higher education, one does not. For every two students who complete a four-year degree, one does not. The irony is that 56 percent of the young men who didn't enter or complete college did so because they wanted to "work and make money." The table below demonstrates how education affects earning potential. With a four year degree or higher, a person typically earns double the income of a person with a high school diploma. Additionally, while college graduates have experienced real growth in wages since 1979, high school dropouts have seen their real earnings decline. 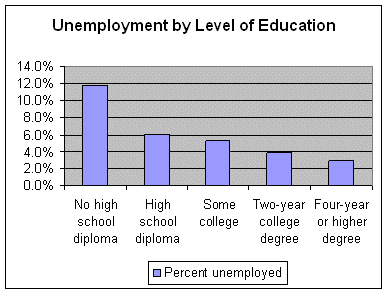 Besides increased earning potential, education reduces the risk of unemployment. As the table below shows, the unemployment rate for workers who dropped out of high school is nearly four times the rate for college graduates. In 2004, the unemployment rate for recent high school graduates who had not enrolled in college in the fall of 2004 was 20 percent. The unemployment rate for young people who dropped out of high school between October 2003 and October 2004 was almost double, 40 percent. As a parent, you can share these facts with your children. College may not be for everyone, but education after high school is critical in today's world.